Financial services firm Broadridge recently had a coming out party as a leading blockchain investor. While the New York investing tech provider had previously voiced an interest in blockchain, it wasn’t until recently it invested $95m in a deal that will find it acquiring new technology assets as part of a bid to develop client-focused distributed ledger services. Later that same week, it hosted a blockchain-focused breakfast with 50 of its clients and technology partners including Credit Suisse and UBS. Broadridge’s more aggressive moves in the blockchain space were preceded by internal testing and, more notably, investments in industry startups. Earlier this year, the firm participated in a $60m investment in New York-based startup Digital Asset Holdings alongside BNP Paribas, ICAP and the DTCC, among others. But the investment hasn’t just been in other companies. The firm has devoted 30 employees to develop multiple proofs-of-concept for its clients, focused on areas such as business communications and trade processing. 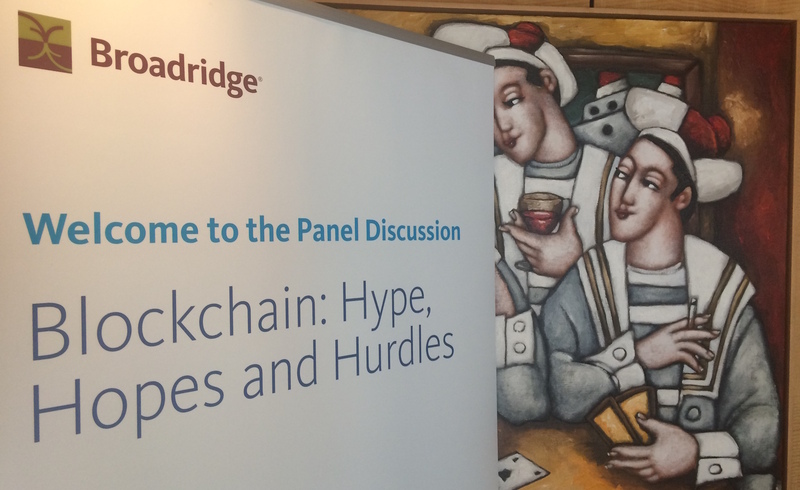 After moderating a panel at a breakfast last month, Broadridge global head of strategy and blockchain lead, Vijay Mayadas, told CoinDesk that strong demand on the client side led the firm to begin devoting significant resources to start capturing some of that interest. In some ways, the $95m acquisition of technology assets from Inveshare can be looked at as a key driver for bridging blockchain with some of the services that Broadridge offers, including mechanisms for proxy voting, or processes by which other parties are brought into the corporate voting process. The deal, announced last month, finds Broadridge agreeing to pay $95m for the assets, with an additional $40m due on delivery of the blockchain applications. Broadridge plans to use the assets it acquired to develop blockchain applications that let stockholders vote at investor meetings in which they were unable to attend, as well as other services connected to its proxy business. Broadridge explained that the Inveshare technology would be used to accelerate the development of blockchain-based proxy applications by increasing the transparency of vote confirmation and reducing the complexity of the current reconciliation process. The firm is not sharing its development timeline, other than saying it intends to be the “first to market with a complete proxy blockchain solution”. In a statement, Broadridge president and CEO Richard Daly confirmed that applications to its proxy voting services are a major focus moving forward. “Integrating blockchain technology into the proxy process has the potential to drive significant benefits for all participants,” he said. Ultimately, both the firm and those attending its breakfast said that the goal is to shave operating costs – and maybe make a little bit of money on the way. Speaking at the event, Chris Church, chief business development officer for Digital Asset, argued this point. He said that should the technology take off those money-saving mechanisms could turn into money generators.